Mindfulness provides proven benefits for increasing our mental health. But it is not always easy to find somewhere to do it if you share your house with family or other housemates. In this article, I’ll give you some creative places to get your fix. If you have a car, it is a great place to go for a bit of solitude. You don’t need to drive anywhere. In fact, if you’re going to do a mindfulness meditation, you probably shouldn’t be driving while you do it! Many of us who have been bored at work will identify with locking yourself in a toilet cubicle to chill out for a few minutes or maybe have a quick game of Candy Crush. It’s also an excellent place to get a little mindfulness in; toilets are typically a place where you will find quietness and nobody disturbing you. The park is probably the classic stock photo of anyone doing mindfulness: sitting in the park on a sunny day. And why not? Getting back to nature has proven benefits for our mental health, too. Find a nice tree to sit under and enjoy the feeling of being outside. Larger shopping centres sometimes have a quiet room. This is a room designed for people who are feeling overwhelmed by the crowds, or parents who need to calm their babies down, etc. These rooms are useful because there is an expectation that you will get some peace and quiet. Mindfulness classes are probably quite an obvious suggestion but are sometimes overlooked in the age when there are so many mindfulness exercises available on the internet and via mobile apps. Classes are great because everyone is doing the same thing, so you will feel like you fit in, and there is typically an instructor to guide you through it. I'm using museum in a broad sense here. For example, I'm counting art galleries as well. 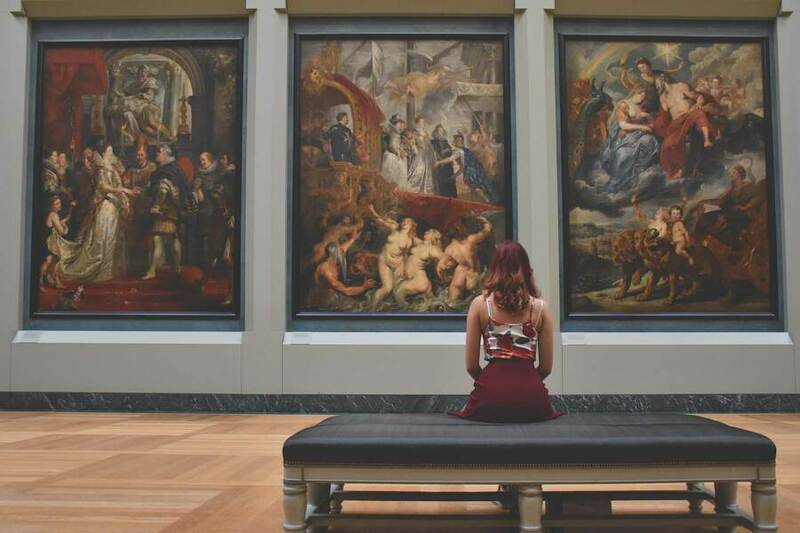 A museum is a good place to do some mindfulness for several reasons. First, there are very few people in them. So, they are quiet. Second, even if many of them do not have an explicit quiet policy, people tend to be quiet while looking around. Third, it is very normal to see people sitting quietly. In the UK, national museums are free. However, if you live in a country where your local museums all charge for entry, the costs could mount up quickly. An art gallery is often a quiet and relaxed place where you can sit for ten minutes. The library is another place where you should be able to find quiet. Many libraries have explicit quiet policies or, at very least, a silent reading room. Take a book if it makes you feel more comfortable. However, it is normal to see people sitting quietly without a book as well. It is a calming environment that is usually full of respectful people. If you need some time alone in your own house, the bathroom can be a good place to find it. For a start, it is often the only room in the house with a lock on the door. Of course, if you only have one bathroom, you could find someone knocking. But you are likely to find five or ten minutes of privacy at a minimum. If you already have plenty of comfortable spots at home to practice, but your house is just too busy during the day, you could try doing it in the middle of the night. Wait until everyone else has gone to bed, get up early before everyone else does, or turn your 4 am bathroom trip into a quick mindfulness session before going back to sleep. Some people put their headphones in and start blasting out their favourite tunes when they hit the gym. Others take an interesting audiobook on the treadmill. This can be enjoyable, but I usually do neither. Instead, I use the time to do some mindfulness. This has its good and bad points. You could argue that it is easier than sitting around because exercise has a positive effect on your mood. But, on the flip side, you often find yourself feeling very uncomfortable when exercising, which can make it more difficult. Give it a go and see how it works for you. If you struggle to find somewhere to practice mindfulness, this list should provide you with some fun alternatives. Why not try one each day and see if any of them work for you. Published 4 June 2018. Written by Chris Worfolk.